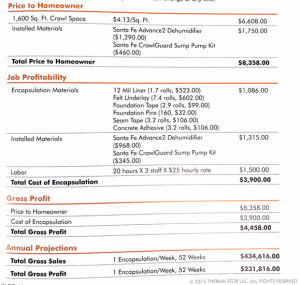 The price to encapsulate a crawl space can vary greatly. 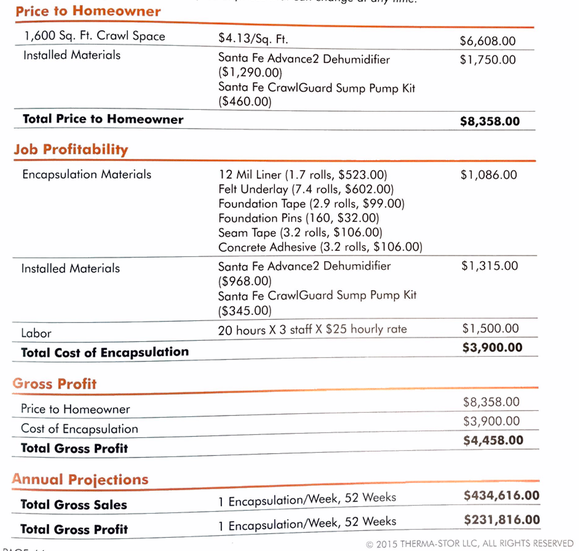 Encapsulation can be as low as $1,500 and as high as $15,000. But why offer this service in the first place? Studies show that as much as 50% of the air in the upper levels of the home come from the basement or crawl space. The air typically contains high levels of moisture. This moisture causes many odors and allergens. The damp air inside the crawl space could also damage the structure of someone’s home, flooring, furniture, and much more. This makes the importance of air quality control an important issue for homeowners. Being in the Restoration Industry you are already in the customers home, maybe even drying out their crawl spaces. You are in a position to offer this add-on service. Best way to do it…be knowledgable on the subject. Know why it is a must-have for your customers and how to properly install and maintain the encapsulation. You have the equipment already on hand and the technicians. Encapsulation services can be scheduled around busy times and be a great service to keep technicians busy during down periods instead of having them “clean the equipment”… again. Don’t miss out on these margins. Watch the video below to see why you should LOVE Crawl Space Encapsulation. Enjoy!